Are efforts by NYPD unions undermining Mayor de Blasio's job approval ratings ? A new Quinnipiac University poll released today shows that 49% of respondents said that they approved of the job performance by Mayor Bill de Blasio (D-New York City), whilst 36% of respondents said that they did not approve. The racial divide over Mayor de Blasio's approval ratings continue to widen from a prior poll. The mayor's approval by Black New Yorkers stood at 71% when compared with approval by White New Yorkers at only 34%. The respective polling numbers were 66% and 41%, according to poll results released on August 26. In a statement accompanying the poll results, Quinnipiac University Poll Assistant Director Maurice Carroll said, "It's a tale of two cities under New York City Mayor Bill de Blasio. Black voters think the mayor is terrific. White voters don't approve. And the racial gap gets wider every time we ask," adding that, "On personal characteristics - leadership, honesty, empathy - the mayor gets positive ratings." By a margin of 70% to 27%, poll respondents said that they believed that decriminalising the possession of small amounts of marijuana would not lead to an increase in crime, indicating that voters solidly supported the mayor's recently announced initiative to issue summonses instead of making arrests for minor marijuana possession. Mayor de Blasio and New York Police Department Commissioner William Bratton announced the change in marijuana policing after the de Blasio administration had come under increased pressure by the vocal activists to the mayor's political left, who had become exasperated with the slow pace in police reforms. However, over-all support for the mayor was uneven throughout the five boroughs. In Queens, Mayor de Blasio received the second-lowest job approval rating amongst the five boroughs : 39% approved, whilst 45% disapproved. His approval ratings in both Queens and Staten Island are under water, with his worst showing in Staten Island. In Staten Island, only 28% of poll respondents approved of Mayor de Blasio's job performance, whilst 63% disapproved. The mayor fared best in Manhattan, where 58% of respondents approved of his job performance. The mayor's job approval ratings in Queens could be being undermined by a public relations battle that has pitted several police unions against City Hall over protracted union contract negotiations and push-back against efforts to reform the NYPD. 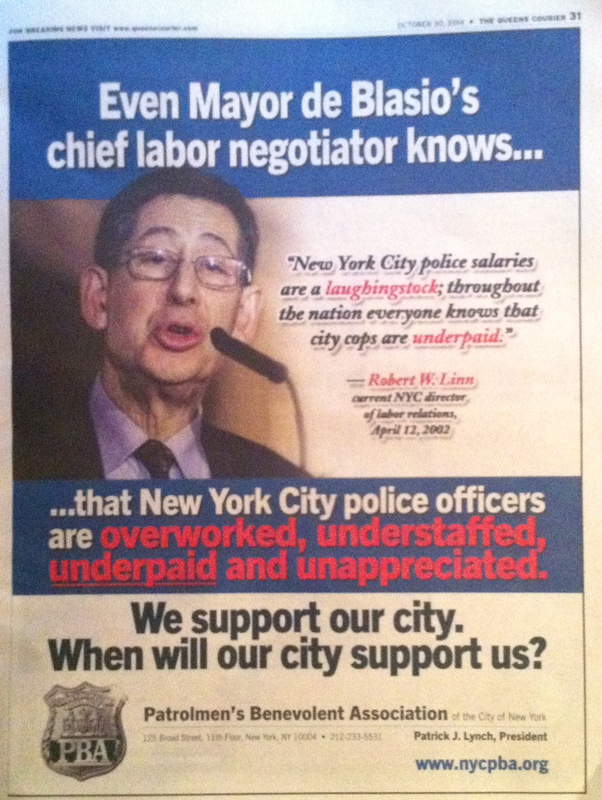 In an effort to sway public opinion in its favour, one police union, the Patrolemen's Benevolent Association, has paid for full-page ads in some English language weekly newspapers in Queens that were critical of Mayor de Blasio. Amongst broad categories of his job, the handling of the city budget was an area where Mayor de Blasio ranked worst amongst poll respondents. Only 39% of respondents approved of Mayor de Blasio's handling of the city budget, indication that perhaps the police unions and other vocal critics of the de Blasio administration may be successfully influencing public opinion. In this poll, Quinnipiac looked into some race issues. When poll administrators asked respondents to identify, without being prompted with suggestions, the most important Black leader in New York City, 17% of poll respondents identified the Rev. Al Sharpton. A controversial figure, the Rev. Sharpton not surprisingly rated an approval rating that was likewise underwater : 40% of poll respondents viewed him favourably, whilst 45% viewed him unfavourably. The poll might find an indirect drag effect on Mayor de Blasio's job approval rating, because 32% of poll respondents said that they believed that the Rev. Sharpton had too much influence with Mayor de Blasio. In the time since the NYPD's chokehold homicide of Staten Island dad Eric Garner on July 17, the Rev. Sharpton rose to a publicly prominent role in City Hall efforts to manage the backlash against each of the NYPD and City Hall, including leading a march on Staten Island that pitted some municipal unions against each other whilst the de Blasio family were on vacation in the Italian Riviera last summer. The mayor's latest approval ratings fared worst in Staten Island. One day before the Quinnipiac poll results were released, the de Blasio administration announced that a chief City Hall aide, Rachel Noerdlinger, was taking a leave of absence over controversies that involved law enforcement, race relations, and ties to Rev. Sharpton, issues which have sparked months of unflattering media coverage for Mayor de Blasio. Ms. Noerdlinger had survived many media attacks by her detractors, but, paradoxically, it wasn't until the NYPD's Broken Windows arrest of her son that she was forced to announce her departure. The NYPD's public relations battle against the de Blasio administration appears to be escalating. Ed Mullins, the president of one police union, the Sergeants Benevolent Association, said Monday that he wanted to see a woman run against Mayor de Blasio in the next mayoral election, according to The New York Observer. Last August, the Sergeants Benevolent Association publicly opposed the de Blasio administration's bid to bring the next Democratic National Convention to Brooklyn. In a discussion tonight on the news program Inside City Hall on NY1, former U.S. Representative Anthony Weiner (D-New York) described Ms. Noerdlinger as a surrogate for the Rev. Sharpton, which opened her up as a political target for critics of the controversial reverend. The lively discussion on Inside City Hall alluded to deliberate leaks by the NYPD to embarrass City Hall -- for example, the leaking of the arrest of Ms. Noerdlinger's son last Friday -- allegations that could be better understood when viewed side-by-side with police union contract negotiations and a push back by police unions against calls to reform of the NYPD. The Quinnipiac poll was conducted between Nov. 12 - 17 of 1,164 New York City voters, with a statistical reporting margin of error of +/- 2.9 percentage points.